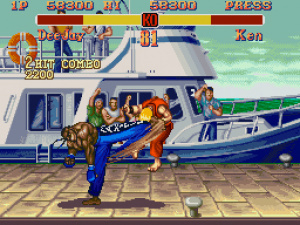 For somebody only wishing to buy one Street Fighter game on the VC this is probably your best bet. It has the most options, its got Cammy, Fei Long, DeeJay and T. Hawk and a number of gameplay refinements that make this a great buy. Lets hope our pals at Nintendo are planning a bit more choice for next weeks VC Friday. Surely there are a few more Megadrive games Sega could throw at them? Super Street Fighter 2 and ......what? That's it? Ok what a lame week for Europe. I love this game, it's been worth the wait! one game. Okay its a good one but its still only one game. that means there'll be a week where we get two crappy games and no good games. Yikes, times seem to be getting a bit tough in this new year. One game? Im one of those suckers that have already bought the previous two street fighter releases on VC, and, ah, yeah im gonna get this one too I dont care I just love street fighter! Unfortunatly I think Nintendo know guys like me exist. Never got to play this one as I had a mega-drive when I was small, so I dont know if its any good or not. Incidently, WHATS GOIN ON WITH THE LACK OF MEGA-DRIVE GAMES!!! At last I'll have a Street Fighter game in my Wii! I've waited a looooooot. I prefer Street Fighter II Turbo myself but that could just be because I play as Chun Li and she had her fireball move taken away for Super Street Fighter II because apparently she was too good. Chun Li can still do fireballs in SSF2. They are just harder to pull off because you now have to charge them up like a Sonic Boom. They don't go all way across the screen as in Turbo either. One game, and it's a version of something we had already. Way to go Nintendo! At least it's a fairly good one. Will, you'll notice that the majority of MegaDrive/Genesis titles are produced by Sega themselves. Maybe Sega are running out of games they created themselves to put on VC? I don't know why they don't let other companies put their games on VC... still if its Sega week next week, we'll probably get Ecco Jr. and Eternal Champions. No one is talking about the AWESOME fireball intro! I love this game! Woohoo! "Chun Li can still do fireballs in SSF2. They are just harder to pull off because you now have to charge them up like a Sonic Boom." Eh, I found that easier, actually. Never was very good at those half-circles. each time we have got a snes game, we have only got 1 game. I hope this is not going to be the norm. I'm just annoyed that so many people told me that SSFII stunk on the SNES, and that I should just get Turbo. Because I really wish I'd just bought SSFII now. I feel like I've wasted 800. Well I'd have to ban myself if I posted what I'm thinking at this moment in time. Which Street Fighter should I get cause I don't have any nor have I played any. Is there really much difference between them? Great week! This is one of those big marquee games, and it's good to finally have it on the VC. I guess some people are upset that they didn't get two token crappy games out of the way at the same time, but meh. Id be pretty happy with Eternal Champions. In fact I wouldnt complain for a week if we got Eternal Champions next Friday. With the addition of the Turbo Graphix, NEO GEO and Mega Drive along with every pre-gamecube Nintendo console why do Nintendo think they can get away with such small updates!? Anyways, is this game playable at all with a GC controller or should I just hold out til I buy a classic controller or even better and arcade stick? When you look at what games the U.S have that we don't, we could've got SSFII and 2 great titles. Ninja Gaiden II? Lolo 2? Anyone? I guess Nintendo is letting the US catch up or something. Excellant game, but only one. Come on big N sort it out. I wish Nintendo could just release the same games everywhere, however unlikely that is. A good game I know, but I'm not interested at all. The releases are getting pathetic. It strikes me with all these sequels coming out within a relatively short time-scale (3 street fighters in a about one year) that it would be good if there was some sort of offer in place for those who have purchased previous installments. Perhaps they could make this version of Street Fighter half price for those who have already got the previous two. I know this is highly unlikely to happen, but it's just a thought. On another note, the reason there may be fewer VC games recently may be the fact that the Wii release schedule has been pretty packed recently (in the UK at least). What with Zack & Wiki, Nights, Ghost Squad, Geometry Wars etc. Perhaps Nintendo thought it should save a few games until the release schedule has slowed. Quit your moaning, guys! On XBLA they're lucky to get one decent game a month, let alone every week! Well i'm guessing the slow release is because nintendo only got a few games left to release . Making them last till Nintendo can get the licence to release a lot of games later on as not all games are released by the manufactures of the virtual console console's . Any by the way i'm getting tired of these complaints from virtual console like costing too much or the fact it's not there favourite title . Well the games are pretty cheap & besides some games i might hate but others love . & Damo i loved you comment . Sounds like you love your Xbox 360/heater . The VC is obviously going to slow down eventually, some people are just can't accept that.. I'd download this but I've already gone and bought Turbo because I was told it was the best. Ah well. "The VC is obviously going to slow down eventually, some people are just can't accept that.."
Why would it obviously slow down when less than 1% of available games have been released? Why should I "just” accept that no decent RPG has been released, or that Nintendo is seemingly focusing on a single genre (fighting) to the exclusion of all others? Please explain why I must accept this of a system I paid cold hard cash on, based on the unfulfilled promise of good classics to be released on the VC? I know what you mean though. I said last night "At least SSFII is great". Sure 1 game when the states got 2 annoyed me. But at least I've got something I really wanted. Not just over a year, no. I don't want ANOTHER SF Game, I already have Turbo and that's kinda enough for me. But heck, again only one game? NoE really wants to tease us . "Well i'm guessing the slow release is because nintendo only got a few games left to release ." Are you kidding?! Adding together all the games of SNES, NES, MD/Gen, TG16/PCe, N64, NG and- as I hear- soon to come SMS there are Virtually t-h-u-o-s-a-n-d-s of Games that could still be released! And if only 1% of those was worth playing they would still have years to fill with them, even at a rate of 3+ games a week. So, to make this point as clear as possible: if people complain, they mostly complain about missed opportunity, and they have every right to do so! This is not taking into account the on-coming wii-ware titles, that most likely will play a more and more importan role in the later time of the wii, yet. Personally, MY biggest hope has always been that the PAL-market get's to see all those games that never made it out of japan or the US on VC, but as it is, this dream is quickly turning into nightmare. Best to ignore VC and hope the releases of hard wii-games compensate for this mess? Seriously, Super Street Fighter II for SNES is one of the best games ever. It was cheap to release the original Street Fighter II a year ago, but this is the game to own. "Personally, MY biggest hope has always been that the PAL-market get's to see all those games that never made it out of japan or the US on VC"
I share that dream, and yeah, it looks like very few "import" games will make it. I will celebrate every one of them though. Khao, what about the TG16 SFI? Damo made a pretty good point up there if you guys didn't see it. XBLA gamers get one retro game a month, if they're lucky. Although the Tron Arcade Game was released recently (in the US), that was t he first XBLA game I bought in months. I think the last VC game I bought was Alien Storm, but still, there are more choices on the VC nonetheless. If you're only going to get one game this week, it doesn't get much better than SSFII. Those 2 would better a third release of SF IMO. I do agree that the VC is better than Live, in terms of games. But in terms of fair releases and demo's, Live wins. And the PSN is just awful with both. But we are talking VC here, not XBLA. MS just does not have those decades of gaming history that Nintendo has. And Bill Gates' pet console has all the money behind it could need. Plus, whenever there is a 'classic' showing up n XBL, it's actually from some other system, be it from consoles or arcade machines, right? Heck, they're taking Goldeneye, whose classic do you think this is?! KhaoShar, GoldenEye 007 is Rare's classic, and Rare is owned by Microsoft. Thus, it's Microsoft's classic. They're not going to release all of their first party games in a big rush, expecting to be able to license more. I think it's a pretty good move to slow down until they can secure more games on the VC for sure. Expect releases to pick up when Nintendo signs another licensee or gets another console on board. And soon enough we'll also have WiiWare to think about, so the VC cutbacks won't seem as drastic.